Root canal treatment (or Endodontics) may be the best procedure to save a badly infected or decayed tooth. 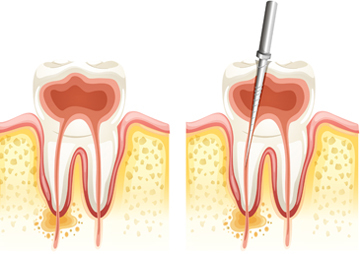 Root Canal Therapy or Endodontics is performed when the inner wall of the tooth has become infected or damaged. Infection can occur for several reasons such as a crack or chip on that tooth, internal or deep decay or an issue with a crown. Surprisingly, the outside of the tooth often appears healthy while inside, it is badly damaged. At the centre of your tooth is a collection of blood vessels and nerves that keep your tooth alive and healthy. This system of vessels is called ‘pulp'. When pulp becomes infected (by cracks, chips, tooth decay or other trauma) an infection may occur. Signs that you may have an infection include: swelling around the tooth; sensitivity to temperature; or pain in the gum area or the tooth itself. Because the pulp is connected to the root canal system, infection can spread quickly and will require what is commonly referred to as Root Canal Therapy. Your dentist will remove the infected pulp, followed by an additional process of cleaning the root canal system and completely sealing it to prevent further damage from occurring. Root canal therapy is the preferred method for treating a badly infected tooth because it saves the tooth by protecting it from further damage. Root canal therapy restores your normal bite and allows chewing while preventing further damage to surrounding teeth through spread of infection. By doing so, there is no need for extraction and replacement with a dental implant or bridge. When root canal treatment can be done on your tooth, the success rate is approximately 90 percent! And most of the time the procedure can be done with a local anesthetic.